A Democratic senator, meanwhile, announced a measure on Friday that would halt military assistance to Saudi Arabia, the United Arab Emirates and other nations battling Yemen’s Houthi rebels until the administration can determine their air campaign has not violated international law. While the United States has provided intelligence support and aerial refueling to the Saudi-led coalition since it began its intervention in 2015, officials have sought to distance themselves from Gulf pilots’ repeated strikes on Yemeni civilians and the mounting humanitarian crisis the war has spawned. In a letter on Monday to Gen. Joseph Votel, head of U.S. Central Command, Sen. Elizabeth Warren (D-Mass.) made reference to the bombing of a bus in Yemen’s northern Saada province on Aug. 9, which local officials said killed at least 40 children. In her letter, Warren asked Votel to clarify his recent assertion that Centcom is unable to determine whether the United States assisted specific coalition flights that resulted in civilian deaths. A report in the Intercept alleged that U.S. intelligence officials had detailed information about one such strike. In another letter Tuesday, 30 House Democrats asked Defense Secretary Jim Mattis, Secretary of State Mike Pompeo and Daniel Coats, director of national intelligence, for a briefing about U.S. involvement in the war, including efforts to avert a battle in the coastal city of Hodeidah, a key humanitarian portal. “I am deeply concerned that continued U.S. refueling, operational support functions and weapons transfers could qualify as aiding and abetting these potential war crimes,” he wrote. On Monday, President Trump signed a defense authorization law containing a bipartisan measure that requires the administration to ensure that Gulf nations are taking steps to protect civilians and end the war before the Pentagon can continue its support. “Our humanitarian principles and our national security interests require that the United States use its influence to end the civil war in Yemen and address the world’s largest humanitarian crisis,” Sen. Todd C. Young, an Indiana Republican who sponsored that measure, said in a statement. Separately, Sen. Chris Murphy (D-Conn.) unveiled a proposed amendment to a defense appropriations bill that would link U.S. aid to ensuring the coalition has not run afoul of international law or U.S. policy on protecting civilians. It is not clear whether the amendment will be adopted. “Either the Pentagon should be 100 percent certain that U.S. weapons and funding aren’t being used to commit war crimes in Yemen, or we should cut off U.S. support right now,” Murphy said in a statement. Congress has also focused on weapons sales in an effort to limit U.S. involvement in the war. New Jersey Sen. Robert Menendez, the top Democrat on the Senate Foreign Relations Committee, has placed a hold on a proposed sale of precision munitions to Saudi Arabia and the UAE. 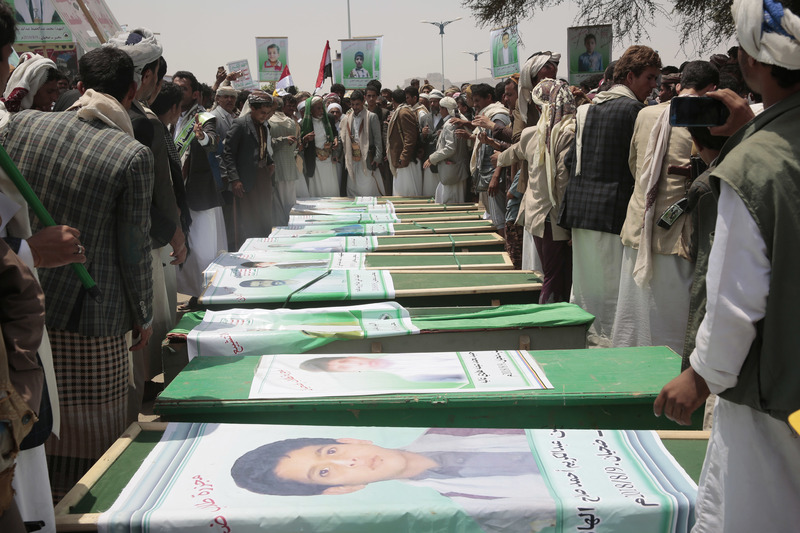 The bus strike killed children on an end-of-summer excursion and galvanized opposition to the coalition’s conduct within the Trump administration, which has voiced strong support for its Gulf allies and echoed concerns about Iran’s links to the Houthis. A senior U.S. official, speaking to reporters in Cairo on Wednesday on the condition of anonymity, said results of the Saudi-led investigation were expected in days but expressed doubts about the coalition’s ability and willingness to complete a probe in the desired manner. Sudarsan Raghavan in Cairo contributed to this report. Missy Ryan writes about the Pentagon, military issues and national security for The Washington Post. She joined The Post in 2014 from Reuters, where she reported on U.S. national security and foreign policy issues. She has reported from Iraq, Egypt, Libya, Lebanon, Yemen, Afghanistan, Pakistan, Mexico, Peru, Argentina and Chile.